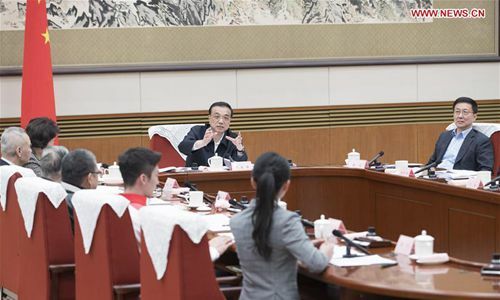 Premier Li Keqiang has said the government should work to address key and difficult problems closely related to the people's well-being and advance a harmonious development of economy and society. Li, also a member of the Standing Committee of the Political Bureau of the Communist Party of China (CPC) Central Committee, made the remarks when presiding over a symposium Friday where he consulted representatives from the education, science and technology, culture, health, and sports sectors, as well as members of the public, on a draft version of the government work report. Seven representatives from relevant fields introduced achievements in their work and gave suggestions on improvements to the draft report. Premier Li said that to accomplish the work for the year, the government needs to rely on the people pulling together and also to make efforts to unleash market vitality and resist the downward pressure on the economy. Issues in the representatives' speeches included education of higher learning, high-quality scientific and technological innovation, urban and rural landscape protection, advancing a healthy development of film and television industry by improving social governance and relying on rule of law, prevention and control of chronic diseases of children, vaccine management, winter sports promotion and building a talent pool for the rural vitalization. Li listened to their opinions, gave responses and asked relevant government departments to pay attention to the issues and improve their work in these regards.